The Kachner Tanda (hamlet) No. 5 is the hamlet of Kachner village which is located on hills and surrounded by mountains. The village communities are nomadic tribes belonging to Rajput Banjara (Lamhan). People get water for 8 months but this water is not safe for drinking purpose. The rest of the period people have to depend on the water tankers which is supplied by the government during the summer months. Presently there is no drinking water provision for the school. After the implementation of the project a provision of a stand post will be made and the school will have access to water from it. This village has been selected for the watershed development programme in 2005 by WOTR. In the preceding year, PRA was conducted to determine the available infrastructure and resources, the social status and locations of the households. Subsequently, PRA regarding the preparation of Problem Tree, to learn and understand the core problem, its manifestations and root causes, was done. It was identified that the core problem was shortage of water for drinking and agriculture purposes. Hitherto, the government has yet not taken any initiative to make provision of drinking water in this hamlet The women and school children have to walk a distance of about 1.5 to 2 km in order to fetch water for drinking and consumption. To solve the problem of drinking water, discussions were held several times in the meetings of Gram Sabha and SMS/SHGs. A private well, positioned at about 900 ft. distance in the field belonging to Mr. Arjun Bhura Chawan, has sufficient water through out the year. The owner has donated 2000 sq. ft plot of the well to the SMS (Apex body of SHGs) for the implementation of drinking water project. It is proposed to deepen and construct the existing well. Also a new water tank would be constructed having a capacity of 25,000 liters. An electric motor on the well would be installed and the water would be channeled through underground pipeline to the storage tank. Construction of 6 stand posts in different locations in the hamlet would be constructed. The water would be then supplied through these stand posts where the villagers could have access water. The village community is willing to contribute 15% of the total cost of the project as their own contribution. The project will be implemented in one phase in 3-4 installments. After the monitoring of the utilisation of the first installment the next installment and so on will be released. It seems to be a remarkable project. Mobilisation of the communities is the key answer to make projects sustainable. How were the nomadic tribal consumers convinced to pay Rs.40/- per month? what is their economic status? It seems there are 6-7 members in each family. Is the amount fixed irrespective of the number of family members? On what basis were a few families waived to pay the monthly charge? 1. The inhabitants of the hamlet had identified the urgent need of drinking water and approached WOTR to address this issue. Several meetings were taken with the local institutions (SHGs, SMS -Apex body of the SHGs and the Village Watershed committee) and the villagers, to design, plan, implement this activity. The role and responsibilities, peopleÃ¢â‚¬â„¢s contribution were also discussed and explained in the meeting. After their willingness to the above, the proposal with all the necessary documents was submitted to us. 2. Economic status : The total geographical area of the hamlet is 347 ha. out of which 228 ha. is cultivable. All families own land of minimum 3-5 acres per family which is rainfed and some lands are of lowproductivity. The main occupation is farming. Usually in a year, they take 2 food grain crops and cotton as a cash crop. Generally they are engaged in agriculture activities for 6 months and remaining months they work as labourers in state/national employment guarantee scheme. The economic status of the Nomadic tribes of Kachner tanda is around US$ 45 to US$ 55 (yearly US$5540 to US$ 666). Watershed development programme is also being implemented by WOTR and after completion of the programme it is expected that there would be increase in food production and ground water. 3. A total of 49 families involving 331 inhabitants reside in the hamlet. Yes, there are approx 6-7 members in each family. 4. Reg. the revenue generation; out of 49 families 44 families are expected to contribute Rs. 40/- ($0.89) per month/family towards the maintenance as well as reserve fund. -The remaining 5 families are considered very poor families such as single parent, widows, destitute etc in the village. All the families in the village are not practically in position to pay the water charges hence it is envisaged that these families will have to be exempted from paying the water charges. Hence while factoring the contribution this was taken into account. how is the PRA, participatory rural appraisal executed? Does it need some special skills? Is the questionnaire easily available, if so, from where? -PRA employs a wide range of methods to enable people to express and share information, and to stimulate discussion and analysis. Many are visually based, involving local people in creating, for example: maps showing who lives where and the location of important local features and resources such as water, forests, schools and other services; flow diagrams to indicate linkages, sequences, causes, effects, problems and solutions; seasonal calendars showing how food availability, workloads, family health, prices, wages and other factors vary during the year; matrices or grids, scored with seeds, pebbles or other counters, to compare things - such as the merits of different crop varieties or tree species, or how conditions have changed over time. -PRA activities usually take place in groups, working on the ground or on paper. The ground is more participatory, and helps empower those who are not literate. Visual techniques provide scope for creativity and encourage a frank exchange of views. They also allow crosschecking. Using a combinations of PRA methods a very detailed picture can be built up, one that expresses the complexity and diversity of local people's realities far better than conventional survey techniques such as questionnaires. -Before conducting the PRA exercise in the village, one should make sure that the village community has enough time to participate in the exercise. The meeting of the villagers should be organised and the purpose of the PRA should be explained. -The selected PRA techniques are mentioned below and on this the analysis is done and shared by the group. A report is prepared based on notes from PRA team members. A preliminary report is prepared and then the final report is made available to all participants and the local institutions that were involved. PRA requires special skills and training for the facilitator. It may be of 3-4 days duration including classroom sessions and field practical. The external team (2-3 as per requirement) is a learner whereas the local community acts as resource person. The external team acts as a facilitator in such way which tries to generate and gather information on the various aspects (social, gender, water etc.) so as to understand the village and its dynamics through the perception of the villagers. A good PRA is - empowering not extractive; making mistakes and learning from it and so is self improving. It also spreads and improves in its own. There is no special questionnaire for the use of PRA. On the contrary, the questionnaire should be avoided instead a checklist can be prepared to gather information from the village. For detailed information you could refer to books available on PRA . Do let us know if you require additional information. Thanks a lot for the detail information on PRA. Would appreciate additional information in future on a list of skilled facilatators working actively in West Bengal. Mobilizing and motivating the consumers or beneficiaries is so important to make any project sustainable. Thanks again. Ã‚Â· Agreed upon a water tariff, but since it is not based on metered consumption, provides no incentive for the water users to conserve. Ã‚Â· The overall investment budget seems reasonable, but without more details about local costs, it is difficult to say more than that. Financing - There has apparently been no government support thus far for either the water infrastructure or related support such as hygiene and sanitation behavioral change promotion, so there is little reason to expect any significant support in the future. So they people will have to rely upon themselves. They have agreed to contribute 15% of the capital investment cost, which shows intended ownership. Water Tariff - They have agreed to pay only Rs. 40 per family (about $0.90) per month as their water tariff (("water tax"). This is not a consumption-based tariff (e.g., not metered), so there is no motivation whatsoever to minimize water consumption. This could be a real problem if people are not inclined to conserve water. That amount may be enough to cover regular O&M, but what about the inevitable cost of replacing major components such as pumps, controls, chlorinators, etc.? How will they pay for that? What if people start using the water for gardening, which could dramatically increase consumption? The planned water production does not account for this possibility, which could generate social discord if not properly dealt with. I note that some people (presumably the very poor) are being allowed to pay nothing for their water. Given the very low and un-metered tariff, this is not a practice that should be encouraged. Storage Tank Sizing - There are different approaches to sizing storage tanks, and guidelines range from 25-100% of total daily demand. The bigger the tank, the higher the cost, but also the greater security of service, meaning the safety margin should the pump fail. For example, using their 10 m3/day demand (331 people at 30 LPCD), the tank should hold no more than about 10 m 3 of water. They might want to consider down-sizing the proposed 25 m3 tank to save on the initial capital investment cost (but see the point on "water consumption" below. Operation, Maintenance, Repair and Replacement Ã¢â‚¬â€œIf it will be responsibility of the villagers, they will need to be trained. Who will deal with inevitable problems such as the need to replace a pump or chlorinator? Otherwise, they will have to hire a private contractor (e.g., a pump supplier). Are they easily accessible in this area? How much would they cost? Is that something the villagers would be readily willing to pay for, above and beyond the "water tax"? Sanitation - Why are such a relatively small number of people "getting sanitation" (i.e., only 132 out of 331)? Who will do the construction of sanitary latrines? Who will pay for the building materials, and who will instruct people on how to locate and build the latrines? Water Consumption Ã¢â‚¬â€œ The design numbers say that they are designing for 55 liters per capita per day (LPCD). This seems high in an apparently poor rural area. Standard LPCD is 30 at the low end, and 60 at the high end. Have the designers taken into account other water uses, such as gardening? Are people here likely to be willing to buy good quality piped water for gardening or watering animals? They may well be when there is no penalty for consumption in excess of the design criteria. Thomas is out of station and will get back to you in a day or so. 1. Financing : Definitely people have agreed to the contribution in implementation of this activity and also to maintain the same in future which can be a sustainable approach. 2. Water tarrif : Yes, there is no consumption based tariff for water use. So there is no equitable sharing of water and control over the utilization of the water. But as per the plan, water tank of approx. 25,000 litres will be constructed and the water will be distributed through six stand posts out of which 5 are for residential use and 1 specifically for school. Each stand post will have two water tap connections. Therefore, 5 families will collect water from one tap. It is planned that everyday one hour in the morning and one hour in the evening, water will be released from the water tank. Since people have to fetch water from the tap for storage in the house generally peopleÃ¢â‚¬â„¢s storage for water is only according to their needs i.e. the quantity of water storage is according to the needs of the people. The time for releasing of water will be decided by the villagers according to the experience that how much water has to be released so that each one gets sufficient quantity of water. People do not use water for gardening. 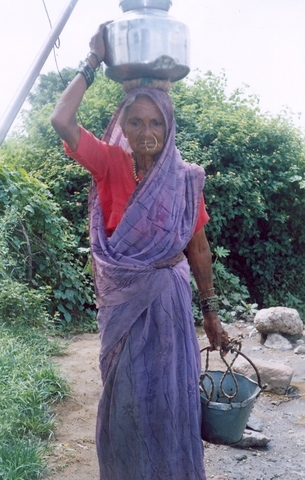 Generally, people provide water in buckets to the animals for drinking. Water committee does promote kitchen garden for which the waste water is used. Regarding the exemption from paying the water tax to the very poor families, the provision or the risk has been calculated but the final decision is of the entire village community, who has to decide the poor to be exempted from paying the water charges. 3. Storage capacity : Regarding the storage capacity of the tank, water requirement per person is calculated taking into consideration of livestock population (@10 Litres for small animals and 25.30 litres for big animals). The total requirement of water for families (10% growth in population over 20 years) is calculated. Considering the actual water requirement per day we have decided to construct the water tank as proposed. 4.Operation: The workshop for the major repairs like rewinding of the motor and repairs of pumps is in the main village Kachner which is located at a distance of 5 kms. The cost of rewinding of the electric motor for 3 HP is between the range of 20-22 USD. Now we have one of the condition that the people should collect at least first year revenue in advance prior to the initiation of the project. (Please refer Revenue generation model). Therefore, there is an availability of sufficient funds in case of inevitable cost of repairs. 5.Sanitation: Our main focus is to provide safe drinking water to the village community. But at the same time we promote preventive health care and personal hygienic habits to be practiced by the village community (Please refer to Shivgad Tanda Answer) and not to construct latrines. 6. Regarding the installation of water meter, so far the water meters are not being installed to any drinking water projects in rural areas as well as in urban areas too (corporation, municipality etc.) But we will try installation of the same in our future projects. This is a good suggestion. Do let us know if your require any other information. Wishes for a Happy Christmas and New Year !. Gandhi said that a nation should be evaulated by how it treats its animals and i like your inclusion of animal consumption needs. It should get the funds applied for since the survey result shows they are in dire need of water. To track and see the status of the project after 3-5 years setting up of a follow-up program is advisable. It can be on a simple spreadsheet recording the dates of chlorination, annual cleaning, repair of wears and tears, costs, number of beneficieries that fluctuate over time, etc.